2003, March 3. Lost Beethoven piece performed. Oboe Concerto in F Major, Hess 12. A Beethoven work that was lost for 160 years has been given what is believed to be its first public performance since the composer's death. The slow, melodic Largo movement of the Oboe Concerto in F Major was performed in front of an audience of 1,000 people in Rotterdam. The eight-minute piece formed part of an evening of concert classics by Mozart and CPE Bach. Of all the genres of music, the oboe concerto was one of the few Beethoven rarely touched. "Premières happen all the time, but a Beethoven piece that's never been heard?" said Conrad van Alphen, conductor of the Rotterdam Chamber Orchestra. "To have a Beethoven première is really special." 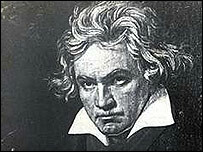 Beethoven wrote the concerto in 1793 as an exercise when he was a student of Franz Josef Haydn. The only known copy of the score vanished from a Vienna publishing house in the 1840s. Its existence was confirmed only in 1935 when an exchange of letters was found between Haydn and Beethoven's sponsor. The sponsor appeared unimpressed with the piece, but his letter confirmed the concerto had been performed in Bonn. The concerto was reconstructed by two Dutch music experts based on sketches found in libraries in Bonn and London in the 1960s. The oboe soloist was Russian-born Alexei Ogrintchouk, who is also soloist for Rotterdam Philharmonic Orchestra. Aged 24, he is roughly the same age as Beethoven was when he scored the concerto. Experts had puzzled over the sketches for years but Jos van der Zanden and Cees Nieuwenhuizen are believed to be the first to reconstruct the work with full orchestration - a project that took them a year. "There's no way of knowing how it would have sounded in Beethoven's time," said Van Alphen.